My research currently focuses on two interlocking questions -- (1) how do stars form and (2) what are the properties of the dust which surrounds their birth? The questions are connected because we learn a great deal about young stars and their natal cocoons by observing the dust around them. I am particularly interested in using scattered light from dust grains to learn about the dust and the distribution of matter in molecular clouds prior to the formation of protostars. Having worked on low-mass star formation for my Ph.D. and massive star formation during my first post-doc, I am now interested in discovering and characterizing the low-mass stellar population of very young regions where massive stars have formed or will form. I am involved in two large surveys of the Galactic Plane: and RAMPS. I am also working on the IN-SYNC survey (part of SDSS III and SDSS IV). As part of the IN-SYNC project, we have used the APOGEE spectrograph to measure the radial velocity dispersion of young stars in the embedded cluster NGC 1333. Because NGC 1333 is still actively forming stars, we can compare the velocity dispersion of the stars with the diffuse gas and dense gas cores out of which stars are forming. The young stars have a larger velocity dispersion (i.e. are dynamically hotter) than the gas and cores from which they form, and appear to be in virial equilibrium, while the cores are sub-virial. The process by which the stars obtain a larger velocity dispersion than their natal cores must act quickly (because these stars are only 1-2 Myr old) and cannot be the result of gas-removal (since the gas is still present). The full paper has been accepted to ApJ and is here. A 3D visualization of the data used in this paper is available. This WebGL model will only work with a relatively modern browser and graphics card. Using adaptive optics on the Keck telescopes, we have conducted a very sensitive search for low-mass protostars in filamentary infrared dark cloud (IRDC). We were able to identify young stars both statistically as an excess of red sources (see above, left) and individually through their extended emission from outflows or reflection nebulosity (see above, right). Low-mass stars are forming throughout the cloud, not just in the dense knots where high-mass stars form. There is also some evidence that high-mass stars form in the more gravitationally bound portions of the filament. For the latter analysis we mapped out how bound the filamenent is in slices along its length (see below). The full paper is here. We have completed a study comparing different methods of obtaining distances to dark, star-forming clouds. We chose a sample of clouds for which there is a direct parallax measurement of the distance to maser spots within the cloud. We compared those distances against kinematic distances (using our knowledge of the rotation of the galaxy to estimate where a cloud is based on how fast it is moving) and extinction distances (using the fact that dark clouds make background stars appear fainter and redder). 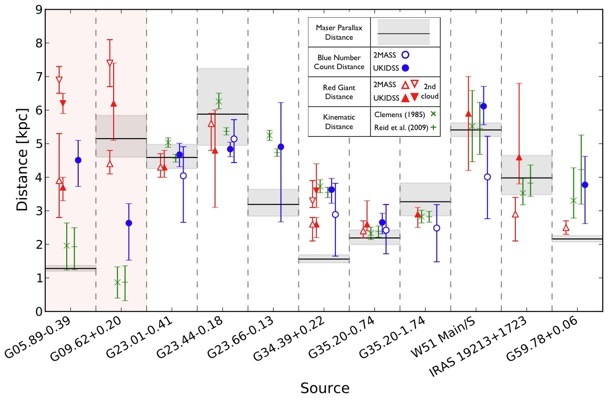 The main comparison figure is shown above and you can read the full paper. In preparation for the large multi-year Millimeter Astronomy Legacy Team 90 GHz (MALT90) Survey, we conducted a short pilot survey to figure out how best to choose our targets and verify that our mapping scheme worked well. MALT90 will survey thousands of dense molecular clumps associated with high-mass star formation in a variety of evolutionary stages (as pictured above). These clumps cover only a small fraction of the Galactic plane, so we needed to select the best way to identify where to look. On the basis of the Pilot Survey detection rates, we chose the ATLASGAL catalog as our input source list. You can see the full results of the Pilot Survey at the MALT90 Pilot Survey Webpage. Ammonia, the common household chemical, is formed in the dense cores of gas where stars form. The structure of this molecule allows us to use various features of its spectra to measure the temperature of these very cold (~ 10 K, only a few degrees above absolute zero) dense cores. This temperature is key to deriving all sorts of other physical properties of the core; in combination with dust emission maps we can learn about a core's mass, its chemistry, and how turbulent it is. With the help of the Spitzer Space Telescope we are able to categorize cores based on whether they contain a young star and whether they are in a cluster of stars and study the physical properties of these different groups. Read my paper on the ammonia Properties of Dense Cores. In deep near-infrared images we see many objects which are not background stars. Instead, they are galaxies composed of billions of stars. Nearby galaxies look very different from stars, but more distant ones can sometimes be difficult to identify. If we want to study young stars galaxies can be a problem, as their colors mimic the colors of young stars at many infrared wavelengths. If we want to figure out where the dust is from the colors of background stars, galaxies are a potential contaminant, since their intrinsic colors are redder than most stars. However, if we can identify them robustly we can use them as extra background sources to make our maps better. Read my paper on Hunting Galaxies. In the course of obtaining very long exposure images of clouds in the near-infrared, we were very surprised to see the clouds themselves glowing. We named the effect cloudshine and modeled it as ambient starlight from many nearby stars reflecting off dust in the clouds. The pictures provide a beautiful qualitative picture of where the mass is in the clouds and how the wispy and condensed structures in molecular clouds exist together. It will also provide an important way to check simulations of what molecular clouds look like, and hopefully a direct measure of the column density of the cloud. Read more about cloudshine.